With a pre-season roster that includes 28 returning letterwinners, the Flying Dutchmen look to build on a successful 2010 season in which they finished third in the Michigan Intercollegiate Athletic Association (MIAA) and sixth among 33 teams in the Great Lakes Region of NCAA Division III. Hope has a long history of competitiveness in the MIAA and NCAA. Under coach Mark Northuis the past 22 season, the team has finished third or higher every year in the conference standings and has been in the top ten in the Great Lakes NCAA Division III Region eight of the last 10 seasons. The pre-season roster of returning letterwinners is one of the largest in recent years and consists of 15 sophomores, seven juniors and eight seniors. The co-captains of the team are senior Nathan Love of Midland (Midland HS) and Andrew McKeachie of Milford (Milford HS). 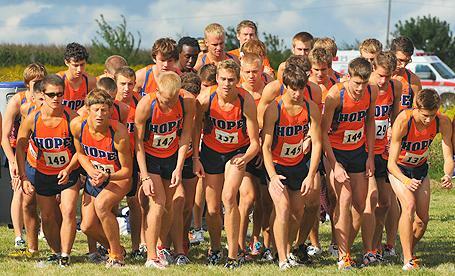 A year ago Love qualified for the Division III national championships by finishing eighth in a field of 240 runners at the Great Lakes championships which were hosted by Hope. He finished 61st among 279 runners at nationals with a career best time over the 8K course. McKeachie received All-MIAA honors in track and field after finishing second in the 1,500 meter run at the conference championships. Senior Kyle Gibson of Alma (Alma HS) was voted the team's most improved runner in 2010 while sophomore Sam Pederson of Mt. Prospect (Mt. Prospect HS) was named rookie of the year. Senior Brian Hernandez of Saline (Saline HS) received All-MIAA honors in 2009 and junior Elliott Barney was an All-MIAA performer in track and field in 2010. Seven of Hope's eight entries in the 2010 MIAA and NCAA Regional championships return -- Kyle Gibson, Brian Hernandez of Saline, Nathan Love, Samuel Pederson, junior Blake Rottschafer of Spring Lake (Spring Lake HS), junior Chris Ryan of Vicksburg (Vicksburg HS) and sophomore Tom Smeltzer of Frankfort (Benzie Central HS). Other returning senior letterwinners are Ben Fineout of Zeeland and Bruce Kraay, both from Zeeland (Zeeland East HS), Returning junior letterwinners are Will Hewitt of Grand Haven (Grand Haven HS), Kyle Mireles of Livonia (Churchill HS), Joel Rietsma of Rockford (Rockford HS), and Andrew Wiersum of Minnetonka, Minn. (Minnetonka HS).